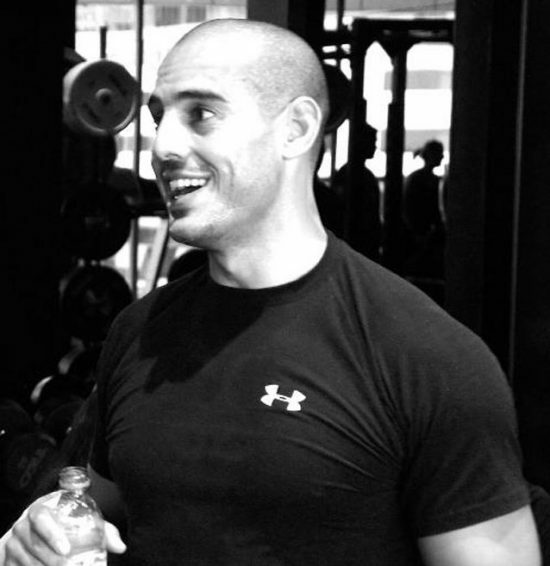 Abu Dhabi Master Personal Trainer Izzy Boudra is a Life Coach and Master NLP from France. With a background in martial arts he started working in the fitness industry in 2006. Izzy is a Master Trainer working at Fit & Flex, located at the Abu Dhabi Golf Club, in Khalifa City A. With a varied list of qualifications and experience from all over the world Izzy is well placed to provide you with a wide range of training plans suited to your needs and goals. His personal training specialities include sports nutrition, pre and post natal exercise in AD, boxing and martial arts, sports training including golf personal training, weight loss and healthy cooking/eating classes, life coaching for families and individuals. Izzy is based in Abu Dhabi, if you need a PT in Al Ain this is also possible subject to conditions, contact Izzy for further information. With a firm background in holistic approach whether it’s nutrition, functional movement or mind coaching, Abu Dhabi trainer Izzy has knowledge and passion to take you where you want to be and ensure all of your lifestyle and fitness goals are met. Izzy offers one to one sessions as well as private group classes including cooking classes and reshaping the body as well as removing negative patterns forever using NLP techniques. Whether you need a PT in Abu Dhabi for personal reasons or perhaps you think your family could do with some extra exercise or better daily habits Izzy has the right qualifications and training experience for all your needs. Izzy’s goal is to provide you with the right tools to succeed in your healthy lifestyle journey, “action without knowledge leads to short term goals, knowledge without actions won’t move you” but if you are willing to make the necessary changes in your life Izzy will create a platform that is right for you to reach your goals. Leading a healthier lifestyle (both mentally and physically) is not just about the gym. From a holistic approach Izzy will engage you in a unique journey to discover and master your mind and body equilibrium. Each personal trainer has their own training methods which are changed to suit the clients needs. Izzy likes to keep his sessions dynamic and varied, to ensure you stay motivated and committed. He uses a variety of equipment including REFORMER, kettlebells, barbells, dumbbells, medicine balls & sledges and tyres depending on the location. Izzy inegrates a MEAL PLAN and Mind Coaching elements to his packages, to maximize results and ensure you are focused. On-going progress monitoring is also an important aspect of Izzy’s training/workout plans, ensuring you can see and feel how you are progressing over time. Anywhere! From your home to Fit & Flex facility, to online sessions whenever you are away from Abu Dhabi! Yes a full BCA test is performed to track Body Fat, Muscle Mass, Metbaolism and Hydration levels, every 6-8 weeks of training. Izzy has everything you will need to train smart and get results. You do not need any specialised training kit at home. Yes. Izzy is a nutrition expert and can provide meal plans to compliment your training regime and also as part of leading a healthier lifestyle in general. Yes, group training session discounts are available for Couples and groups of up to 6 people. Yes! All your personal training sessions are pre booked for the month ahead. You should give Izzy at least 24 hours notice to cancel a training session. Izzy is unavailable for personal training in Abu Dhabi at this time. Please use the ‘Find A Trainer’ option in the top menu to find an alternative trainer near you. I started personal training with Izzy in June 2016 after having ballooned in size due to unhealthy lifestyle choices and just being lazy. Within the first month, with a careful detailed plan of exercise and nutrition, the results were already apparent. It’s been close to a year now that I have been training with Izzy and I have gone from couch potato to someone who leads a more active lifestyle. I train with Izzy two times a week, and continue the momentum by doing some sort of workout throughout the week. Paired with a healthier diet, the change has been tremendous! If you are looking for someone who motivates you (even while on holiday!) and carefully plans your nutritional intake and provides great advice – health or otherwise – Izzy is the trainer for you. I'm doing classes with Izzy since 2013: Power pump, functional training, boxing, small group training, personal training inb Abu Dhabi... Until today I enjoy every single class as Izzy is a brilliant motivator. You feel that he loves his job and with his enthusiasm he is pushing me always to my limits. He adjusts the training to your personal needs and takes care of your body and your mind. Izzy always has an open ear and gives helpful advices regarding fitness and healthy lifestyle. Over the last years Izzy became a very important person in my life and he is more than only a coach for me. I'm not one who trains much (or at all to be more precise) but Izzy changed that... He is not only a fantastic all round personal trainer, but a great person too - One of those people that always has a smile on his face, motivates and inspires. His training/classes are always a good hard workout, but at the same time fun. He goes the extra mile to advice on nutrition and clean eating and as a result, has rubbed off on me. Enthusiastic and knowledgeable but also great fun to work with. A positive approach and attitude continues to motivate me. Because of Izzy's help and guidance I am fitter and in better shape now and his input/advice re nutrition has helped me maintain momentum. He is flexible in his availability and makes the workouts interesting and varied but always keeping goals in mind. Izzy is a wonderful personal trainer with an amazing personality. He is friendly, motivating, firm and patient. Thanks to him I reached a fitness level I didn't dream to reach otherwise. I am super happy of the results and recommend Izzy's professional skills to anyone serious about getting a great fitness level.